Couldn’t help this folks! I was looking through my old notebook and found this doodling sketch (please click over sketch to enlarge). 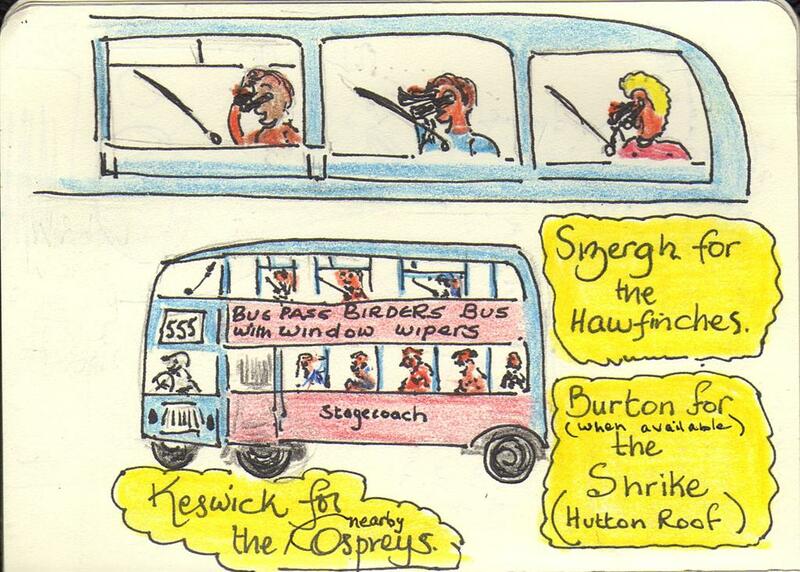 It was great to have this vision of the “Bus Pass Birders Bus”, in fact it was the 555 which stops right outside my house in Burton, so how’s that for a service….. with a smile. Well whether it’s a smile from him at the wheel, I’m not so sure, but its certainly a smile from me. 95% of the drivers I get will either give a great welcome “hi”…, and sometimes some have a smile to go with it, and some I find greet you with a just about audible “grunt”, and there are others who are just carrying on giving someone the “silent treatment” maybe from breakfast or maybe to be sociable is not their thing. Nothing wrong with that if that’s the way they want it…But yesterday, and today I choose to be with the happy chappies. These new buses are great, especially with that bigger than life upstairs front seat panoramic view. And the buses are aptly named after the “pikes” so far I’ve had “Helvelynn”, “Loughrigg” “Langdale” and yesterday it was the mighty “Skiddaw”. I must remember to take some photos of those buses next time out. Thinking about it others might say, "there goes another blinkin anorak"! so what!, what’s wrong with “another anorak”, some of us were train spotters in the 50s, and it still rubs off, and some of us are also birdwatchers today! And some of us might even be daft enough to go to the same place everyday and count birds flying past. I did say, for my part Birdwatcher yes! but Twitcher no! Will somebody please tell them the difference. I really do have to smile or there again I might even laugh when someone calls me a “Twitcher”. I guess sometimes I may even resort to the “screwed up face mode” with the extras thrown in of “eyebrows raised high” whilst at the same time trying to smile! how cheesy that must look, eh..! 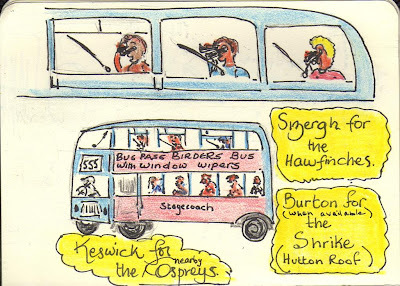 And I do often think about the “Bus Pass Birders Bus” needing further improvements such as having windscreen wipers and demisters going when its raining.